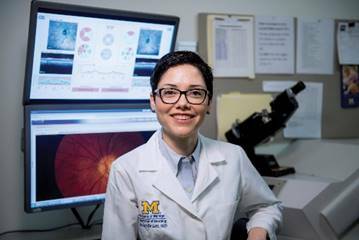 Every year, the proceeds from March Hoops To BEAT Blindness are dedicated to a specific research program at the University of Michigan Kellogg Eye Center. The program is chosen for its innovative approach and focus on treating and finding cures to blinding conditions. This year, funds from March Hoops to BEAT Blindness 2019 will go to support the research of Dr. Lindsey De Lott , MD, MS.
Dr. De Lott is a specialist in the field of Neuro-ophthalmology, which focuses on vision problems related to the brain. This field is important since nearly half of our brains are devoted to sight and eye movement. There is so much we have yet to learn about how neurologic diseases effect sight and how to effectively treat and manage these diseases to preserve vision. One specific area of interest for Dr. De Lott is investigating treatments for optic neuritis. Optic Neuritis is inflammation of the optic nerve. 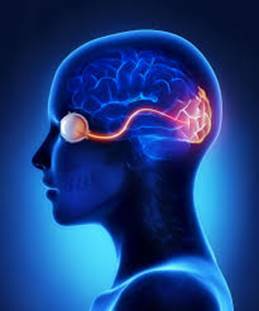 The optic nerve delivers visual information from the eye to the brain. When the optic nerve becomes inflamed, it can be very painful and it can strike suddenly or develop gradually over 1-2 weeks. Optic neuritis is most common in 20-40 year olds. It is the most common condition to affect the optic nerve in young adults. There are different causes of optic neuritis, but one common cause multiple sclerosis (MS). In fact, over 50% of people with MS will have their vision affected by optic neuritis. The only acute treatment for optic neuritis is corticosteroids. Corticosteroids work to speed up the recovery in some people. However, for many people, it is not helpful. Long term immunosuppressive treatments can be used to prevent relapses for some types of optic neuritis. What is the Research Program? Dr. De Lott's research focuses on identifying the right course of treatment for the right person. The traditional treatment for optic neuritis is to treat it with a short course of very high dose corticosteroids. Although this is effective for some patients, there are some who receive no benefits and therefore, only the harms of treatment. We need to understand why corticosteroids are effective for some people, but not others. This information can help us target therapy to the right patient and avoid the harms of therapy in someone who is unlikely to respond. It can also help us to plan future clinical trials with novel agents so we can make sure we are targeting those patients are most likely to benefit. Dr. De Lott is studying the data about both kinds of patients – those for whom corticosteroid treatments were effective and those for whom it was not. By analyzing the data from clinical trials and observational studies, Dr. De Lott is searching for the key characteristics which can predict the effectiveness of treatments for each individual patient. We are trying to understand: (1) which factors predict whether an individual patient will recover vision or not and (2) how corticosteroids effects recovery. This kind of information is critically important so that clinicians and patients together can weigh the benefits and harms of therapy, and patients ultimately feel empowered to make the best decision for their own care. This line of research also provides opportunities to learn more about why certain patients do not recover vision and/or do not respond to traditional corticosteroid therapy. With the goal of identifying an effective course of treatment for each individual, the results of this research will allow us to identify those patients who do not respond to traditional therapy, but may benefit from new medications with the ultimate goal of preventing permanent vision loss and restoring vision in all patients with optic neuritis. How Does This Research BEAT Blindness? Dr. De Lott's goal is to accurately predict visual outcomes and to identify effective treatments paths for patients with optic neuritis. In addition, she is pushing to make discoveries to minimized vision loss and even to finding ways to reverse vision loss from optic neuritis. Much research is needed in this area to develop effective techniques to provide successful treatments. MHBB funds will help Dr. De Lott's efforts to better understand visual outcomes, identify effective treatment paths for patients with optic neuritis, and to find ways to prevent and reverse vision loss! at the University of Michigan Kellogg Eye Center! BEAT BLINDNESS - DONATE NOW!